Ask Us ! - The French Connection ? 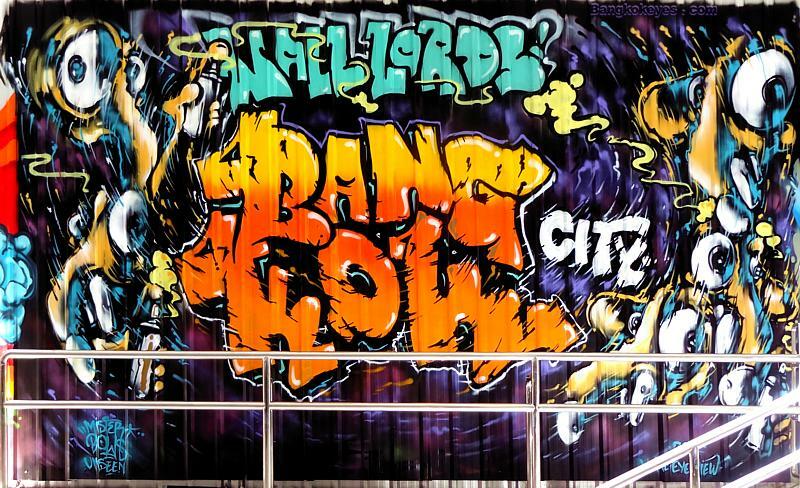 We at Midnight Hour had been tossing and turning - how to do up a story on some of those early Nightlife entrepreneurs that made a significant impact on the Bangkok Nightscene? Just as we were about to throw in the towel, we received a most serendipitous email with 3 very old photos from "J.N..", a regular contrubutor to this site. That was all it took - our productive juices flowing, we pounded out the below thumbnail 'Nightlife Histories' for your perusal. BTW, the three photos (with captions) are excerpted from the Rolling Stone, 10 May 1984 issue.  - Excerpted Rolling Stone Magazine - Copyright 'fair use' allowances and restrictions apply. 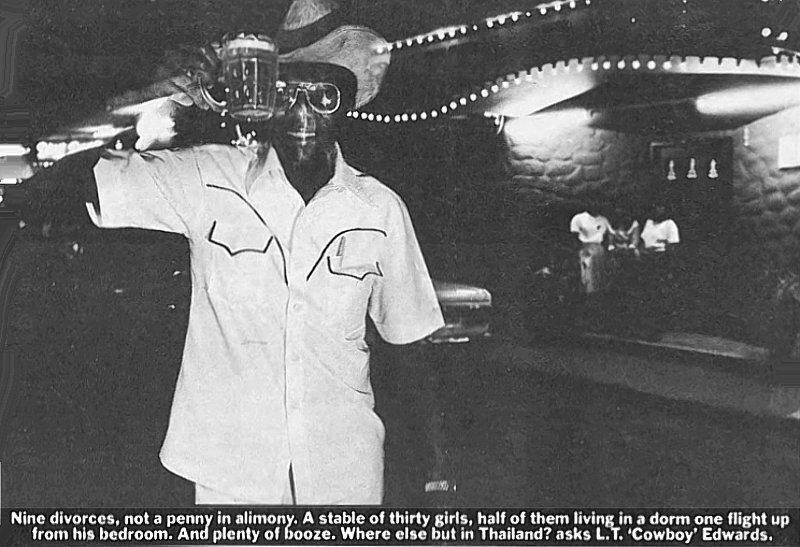 In Bangkok there was only one Cowboy - T. G. "Cowboy" Edwards, a retired American airman from the Viet Nam War era who became involved in the "bar business" on a quiet Bangkok soi back in 1977. Cowboy got got that nickname for obvious reasons - his 'cowboy' get-up - western shirt, belt buckle and cowboy hat. His Cowboy Bar was not the first bar on that small soi between Sois 21 and 23 - the seminal Gold Label, Chitra's (the original one), and Loretta's to name a few earlier Nitespots. But it was the one that caught the imagination of the Expat community, to include nightlife columnist Bernard Trink from the Bangkok World / Bangkok Post. Bernard Trink's Nightlife news columns became so popular in the '80s and '90's that they were distributed as separate handout supplements at hotel reception desks. 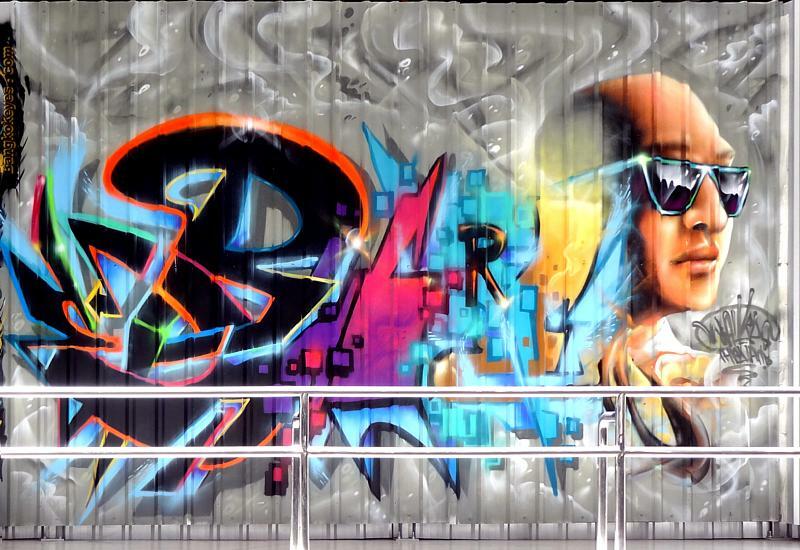 What Bernard wrote was Nightlife Gospel for Bangkok and Pattaya for almost 30 years. These newspaper supplements (before the Internet) were folded twice and placed in envelopes by unknowable nunbers of Expats, and mailed to the four corners. 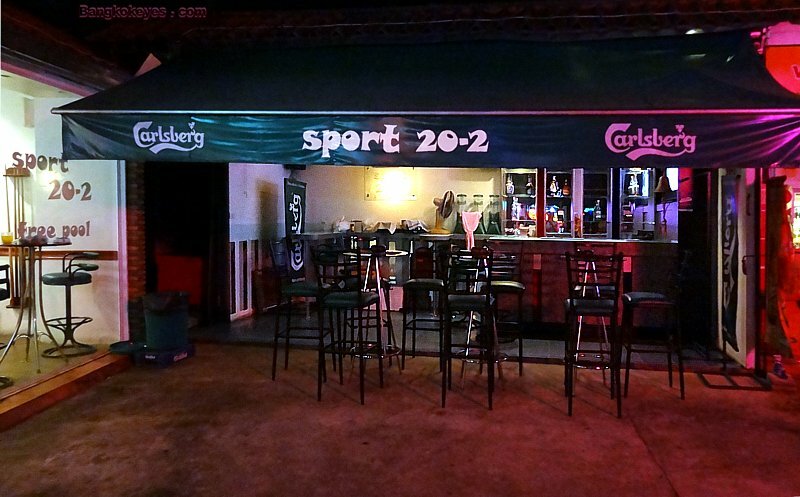 In these columns, Bernard regularly reviewed those new bars on what had become known locally as "Soi Cowboy". The name stuck - and in today's parlance, 'went viral'. Today, Soi Cowboy is on the map. Google it - find it on Google Earth. 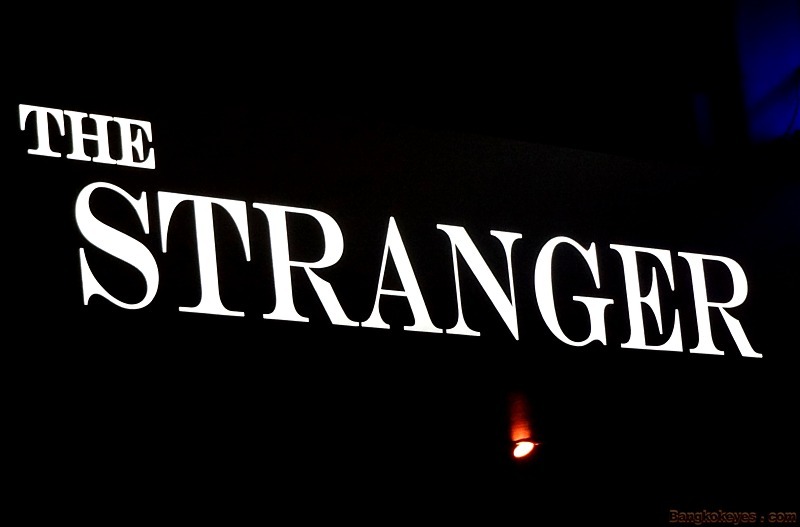 It is a Night Entertainment Landmark. Cowboy (the man) however did not ride the crest of this rise in popularity. Getting drunk meant going broke, and going broke meant getting 'divorced', and meant selling the bar. But this was not the end of the world. Cowboy Edwards may have been down, but he was far from out. In short order, he opened another bar in Washington Square (predating the Square One). The new bar seemed to start out well, but went belly up shortly afterwards - neighboring Washington Square bar owners attest that the reason was, once again, his "drinking up all the profits". But Cowboy wasn't yet ready to give up - not by any stretch of the imagination. He partnered with Grant Francisco, a retired fire chief from the Viet Nam conflagration. They opened the New Cowboy Bar deep in Soi 22. It is still there today. The joint venture between he and Grant was based on a loan from Grant. I don't have to tell you how that went. Grant was strung out financially, and had contracted cancer, so he finally gave Cowboy an ultimatum; pay up or leave. Cowboy, also in ill health, soon left Thailand for medical treatment. He died, not in Thailand, shortly afterwards. It wasn't much after that, that Grant succumbed to cancer - the bar continuing on in the hands of relatives. 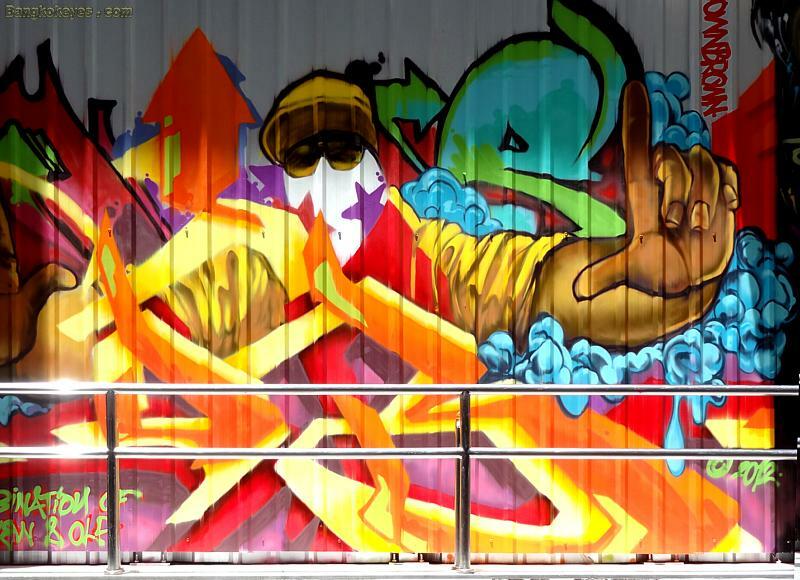 Nevertheless, for all his successes and failures, "Cowboy" Edwards, has left an indelible, and very permanent footnote (or two) in the history of Bangkok's Nightlife Scene. Rick Menard's story also started in Viet Nam during the Viet Nam War. In 1962 Rick, in the U.S. military, was stationed in Nha Trang in Central Viet Nam. (An interesting aside: while assigned there, Rick made history -of sorts- when he became the first U.S. serviceman to get married in-country -legitimately through proper channels- to a Vietnamese national.) In 1966, when Rick's military obligation was behind him, he hired on directly with a civilian company there in Viet Nam. He continued on at that company in Saigon until mid-1968, at which time, he was transferred to Korat, here in Thailand. Not long after that, while visiting Bangkok, he met Udom Patpong in the Other Office Bar, predecessor to the Old Other Office Bar, which is still on Patpong II today. One thing led to another, and over a handshake, he and the senior Khun Patpong agreed that Rick would open a bar in what was then a gift shop / barber shop on Patpong I.
Rick quit his company job in Korat -virtually the next day- and went to work on what was to be the Grand Prix Cocktail Lounge and Bar. (Later to be the Grand Prix Disco). Rick ran the Grand Prix from 6 February 1969 until he closed it down on 15 April 1991. His future was now going to be with his family in Las Vegas - he would relocate there to insure his daughter received her proper education. But during the 22 years preceeding his retirement to the US, the Grand Prix gained a heap of notoriety, and a long list of famous patrons, to include Mr & Mrs Walter Cronkite, Jackie Stewart, Don King, Pinklon Thomas, Ed Brady, Meredith Viera, Bob Hope, Tennessee Williams, Robert Ginty, Willem Dafoe, Gregory Hines, Craig Johnston (Liverpool United), Sam Waterson, Cozey Cole, and on, and on, and on. 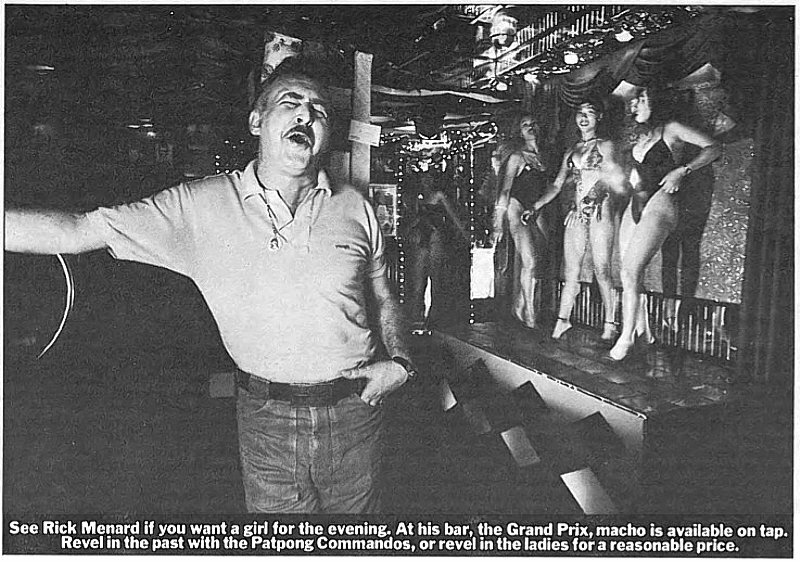 But all of this pales next to Rick's seminal contribution to the Bangkok Nightscene: The Grand Prix was the first Expat bar to introduce A Go-Go dancing as a regular feature. He gets either all the blame, or all the credit, depending on how you look at it. But, alas, Rick is no longer with us, having died a few years ago in Las Vegas, leaving behind a wonderful family and about five hundred thousand friends. In his last (snail-mail) letter to me not long before his death, he stated, "I can say that most people�s wildest fantasies were my realities for the 30 some years I spent in the Far East." And who are we to refute that? 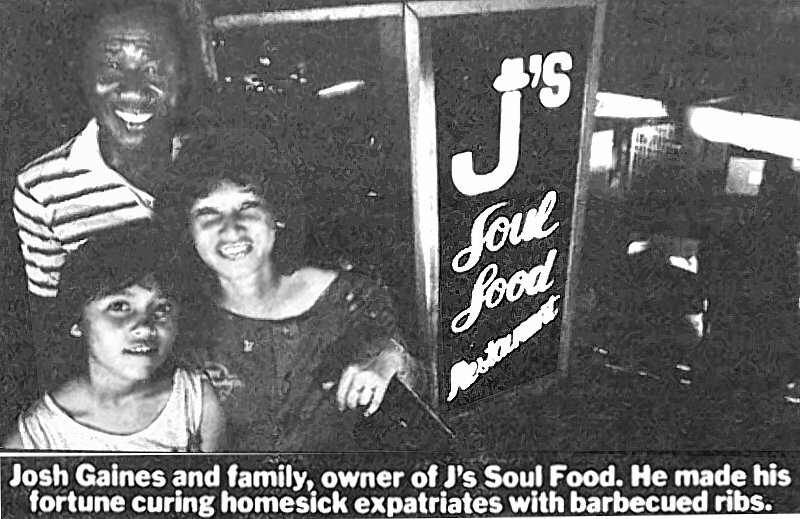 Soul food came to Bangkok in the mid-70's. And it came through a circuitous route typical of the strange tales of Expats settling in Southeast Asia. Mitch, a U.S. serviceman stationed in Viet Nam during the war decided not to return to the U.S. after his tours of duty ended in the early '70's. Instead, he opened a small restaurant near Saigon's Tan Son Nhut airbase. 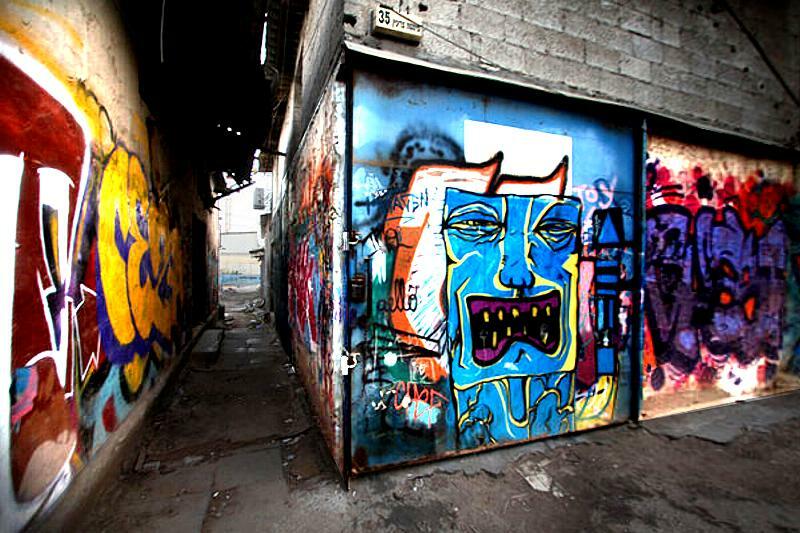 It was located down a small soi (hem) just off the larger Hundred-P Alley (one hundred Piasters was the price of a stand-up short-time in any of it's many darkened doorways). Mitch named that small villa-shophouse eatery Mitch & Nam's Restaurant; "Nam" was his Vietnamese wife (and business partner). Needless to say, it's menu was 'soul food'. But when it became evident that the U.S. presence in Viet Nam would not be indefinite, Mitch moved lock, stock and barstool to Bangkok. The only thing he didn't bring with him was Nam, his wife, whom he couldn't get out of country. He did, however preserve the old name, Mitch & Nam's Restaurant, once he got it up and running at the top of Sukhumvit Soi 16. Mitch had a complete range of soul food to offer, but he excelled in two menu items; ribs and biscuits. Mitch also liked his liquor, so on some days the biscuits weren't as good as others. But when he was sober, the biscuits were the best in the world. That's not a misprint - the best in the world. The regulars, yours truly included, came to calling these biscuits "Sober Mitch Biscuits". He had a small bar off to one side, where the mostly black American clientele would come on Sunday mornings to get a hair of the dog and watch 8-mm Greatest Fights Of The Century films, courtesy of Russ Lewis. Mitch also had rooms for rent at the back. But Mitch was getting busier, and his drinking wasn't improving his health any, so he brought in a trusted friend, Josh Gaines. It was about this time that the Rachada Extension was being pushed through Soi Asoke on down past where the Queen Sirikit Center would eventually be, and down to Rama IV in Khlong Toey. The widening of the road at the Asoke Intersection necessitated the demolishing of Mitch & Nams (during the transition and construction the property was temporarily a used as a used car lot). But the long and short of it, Mitch reopened in Soi Cowboy (near today's Five Star). Josh also came over at that time. Josh eventually sold out - the ever expanding A Go-Go bar boom on Soi Cowboy made property values (leases) too expensive. But Josh didn't disappear, he gravitated to the newly developing Washington Square, and was Chief Chef at a few select bars, the Silver Dollar Bar most notably. If I hadn't seen Josh for a while, I was always sure of running into him and catching up at the annual Fourth Of July Picnic. Josh is no longer with us, having died a while back here in Thailand, leaving behind a young son. And with Mitch and Josh both having departed, Bangkok is left without a soul food restaurant. I guess they just aren't that popular any more. What I wouldn't give for some Sober Mitch Biscuits...... Now we have "fusion" food - WTF is that supposed to be? 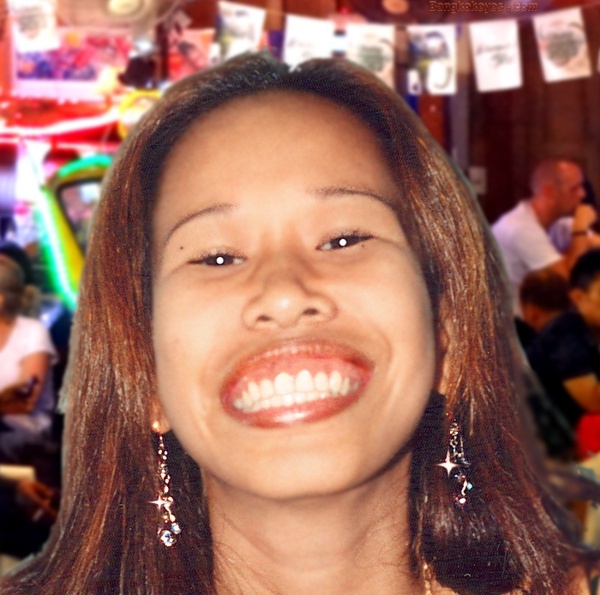 Our Thai Smile this month was a Suriwong Road girl with a huge smile and even bigger... heart. I used to be a regular visitor to BKK and always booked a room at the Silver Dollar in Washington Square. Agahst to just discover on YouTube that it has been demolished. Are there any other similar bordellos that can be found for 400 baht / night with wifi and friendly food with delicious girls on the skytrain route? Washington Square is rapidly closing down, and is being demolished. The Silver Dollar, the Texas Lone Staar and the Bourbon Street are closed - so Washington Square would be out of the question for rooms. Bourbon St has moved to Soi Ekamai - Soi 63 - and is near the Ekamai Skytrain station - and still has rooms for rent. Seriously doubt you will find any rooms nowadays for 400 baht a night along the Skytrain route. 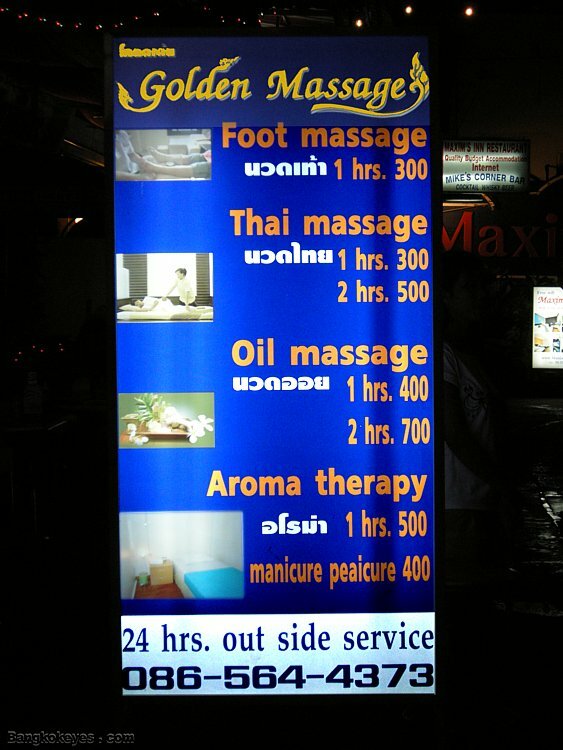 More like 1,000 baht a night. 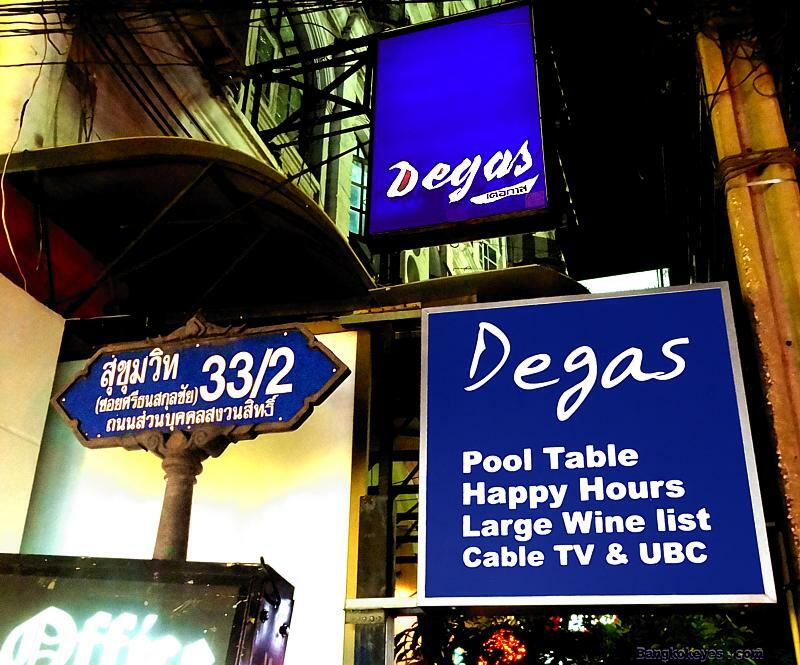 There is however a larger selection of small 'boutique' hotels along Sukhumvit. One is the Ever Rich near Soi 7, and another is the Maxxim on Soi Eden - Soi 7/1 (both near Nana Skytrain station). These hotels are guest-friendly. 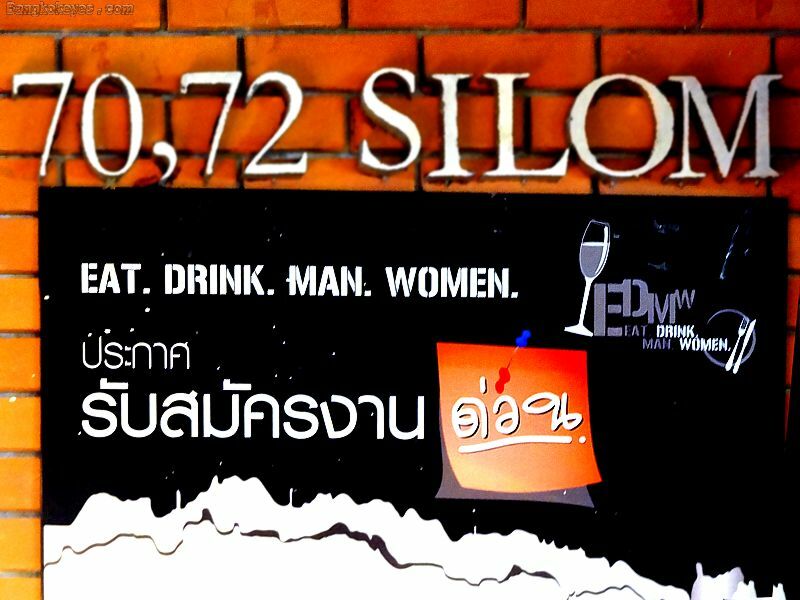 Some of the bars on Soi 7/1 have rooms upstairs, but I do not know the price, and have not viewed these, so I will not recommend them. You might want to check with Bangkok travel agents (on line) to see if they can give you prices on these hotels (can also Google them directly, and if satisfactory, book a room). Also, once you arrive, check into one of these for a night, then scout around for another place more suitable for your second night onward. Not gone, but gone, Radio City sits all but empty, night after night. The only people seated that once popular music bar are street touts and louts. It's upstairs Lucifer Disco, closed since April 2010, has shown no sign of being renovated or reopened. How much longer do they want to go on paying rent? The King's Garden has some brand-new neon. 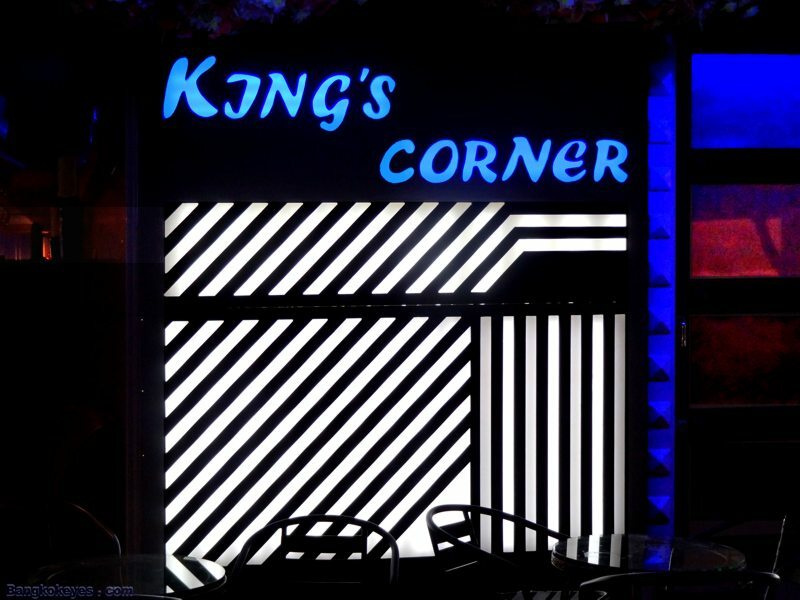 Only one problem - the neon says, "King's Corner". And if this is to be the new King's Corner, then what is to become of the King's Corner that already exists, not 50 meters away on Patpong I ? Let's just wait and see how this will sort itself out. In the meantime, the new neon facade continues to dazzle. The Glamour Girl has quietly, and subtly, changed it's name to just Glamour. It would, however, take a close inspection to notice. The prime agendum, A Go-Go, remains unchanged. Good, if somewhat limited floors on stage. We wish them constancy. The long standing Plaza Massage , has failed to answer the bell for the next round - only leaves and litter collect in their darkened doorway. They have closed temporarily before, but this time around things look derelict. The Cowboy 2 has had a giant rooftop 'Cowgirl sign' for years, but they have recently 'refreshed' it. We thought it appropriate to snap a photo for the archives. Let the good times roll. And while we are still on "official names", the Eat. Drink. Man. Women. (EDMW) is the correct name for the Nitespot at the top of the soi (we got it right the first time, but it seemed too unusual to be true....). BTW, while we were there we did see a lot of eating, drinking, men and women - so it looks like the place is taking off. The Degas is in total lockdown. Although we see signs of life during the day - it doesn't like 'renovations'.... We fear the worst - the Degas has been at that location for the last 20 years - one of the pioneer Dead Artist bars. We'll keep an eyeball peeled and get back to you if it should suddenly come back to life. Rolling out the red carpet for the very first time is the Tuk-Tuk Bar bar beer, which has taken over the reins from the long-standing Top Secret bar beer. Welcome them as they give a roll to the dice. For you historians, the Top Secret goes way back - way back to Clinton Plaza before it was Clinton Plaza (originally called simply "Entertainment Plaza"). This takes us all the way back to the beginning of 1999. The Top Secret closed down operations in Clinton Plaza in August of 2002, when they saw there was no hope of reviving business there - Clinton Plaza was doomed. The Top Secret reopened almost immediately the following month, September, at Queen's Park Plaza. 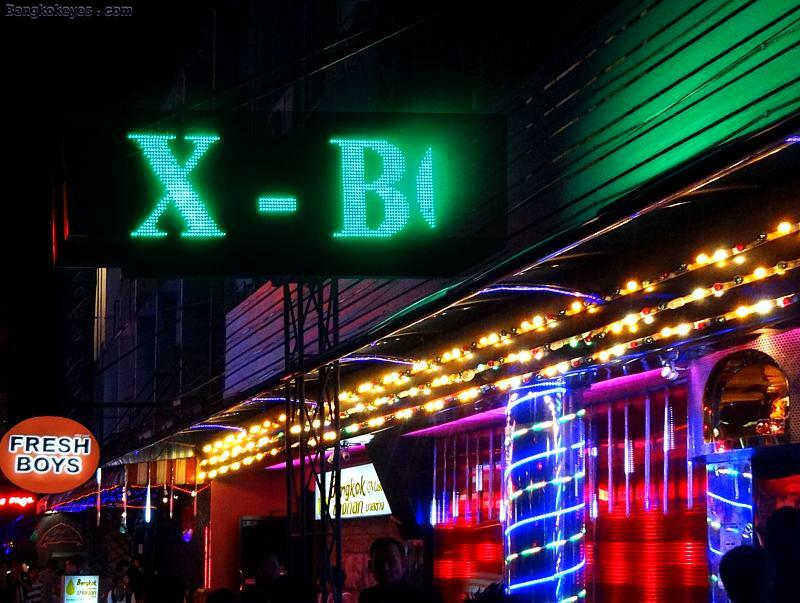 The XXXX Bar has also reopened, also as expected it might (the chattel within was never removed). Welcome them back to the sharkpool. 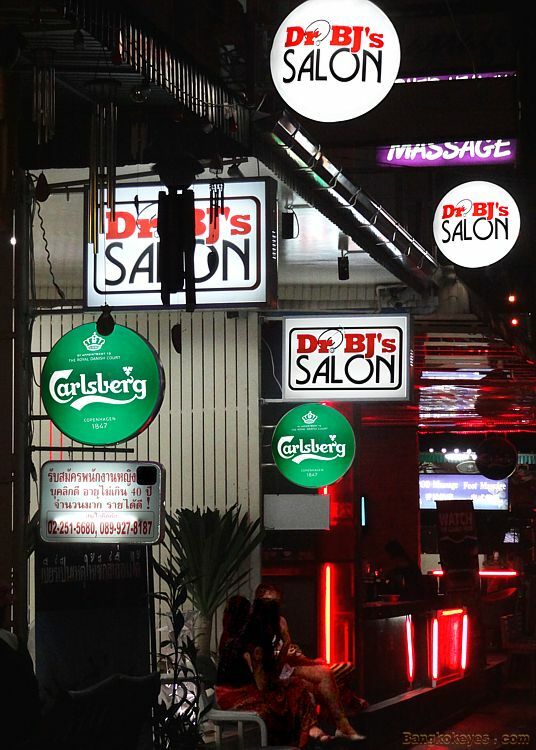 The Dr. BJ's Salon has put up even more new neon. If that's what you came to Soi Eden for, you can't miss the place. Modus operandi - as advertised. The Golden Massage actually reopened last month after a brief closure. But they are definitely back full tilt boogie, as we speak. They are upstairs above the Night Flight. The X Boys scrolling LED sign can't be read all at one go - but they are still quite obviously they. Another photo for the archives. The 2nd floor Pink Piano Bar & Lounge reopened after a brief closure - located above the Pink (Pink Panther). The Silver Dragon up on the 2nd floor closed down for renovations - to include the absorbtion of the old Nancy Bar. It was located at today's Mercury Bar slot. Both the Obsession (ground floor) and the Cascade (3rd floor) reopened after brief closures. The Play reopened in it's same digs - now the 4 Sports. Bobby's Arms opened at the very end of the soi. This was an extension of the original Bobby's Arms up in the Patpong II parking lot. No Nitespot occupies those premises today. The Sugar Beat bar beer outside the Hollywood Rock closed down for good. The 33 Center Pub reopened after a brief one-month closure. Today the Akane Fashion Massage holds down those premises. The Laguna Restaurant reopened after a brief closure. They were located at today's Meaw Meaw Bar slot. The Coconat Globe Bar opened up on the far side - in what has now become Nan's Bar. A decade ago, Chan's Corner Restaurant and an unnamed Short Time Hotel located in the rear Warehouse parking lot closed for good. - Excerpted New York Times - Copyright 'fair use' allowances and restrictions apply. It all started in Tel Aviv's Florentin neighborhood last year during the street protests along Rothschild Boulevard near -not coincidentally- the Bar-Ilan University. 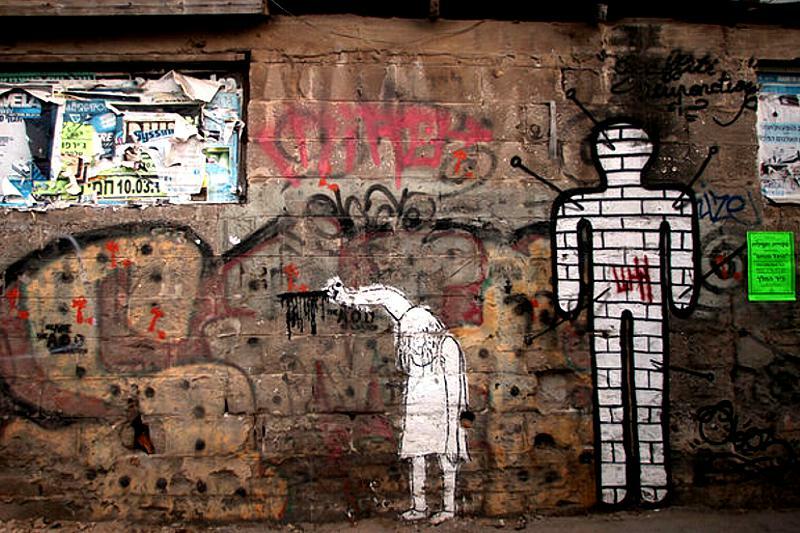 The protesters were, as it worked out, prolific in their output of graffiti - much of it political in content. Guy Sharett, a Hebrew language instructor in that area was almost immediately inundated with questions from his students as to the meanings of various graffiti they observed on their way to and from classes - the graffiti was obviously in Hebrew script, yet in most instances, entirely elusive as to message content. Sharret quickly saw the possibilities, and commenced taking his students, and others, on paid guided tours of the neighborhood. 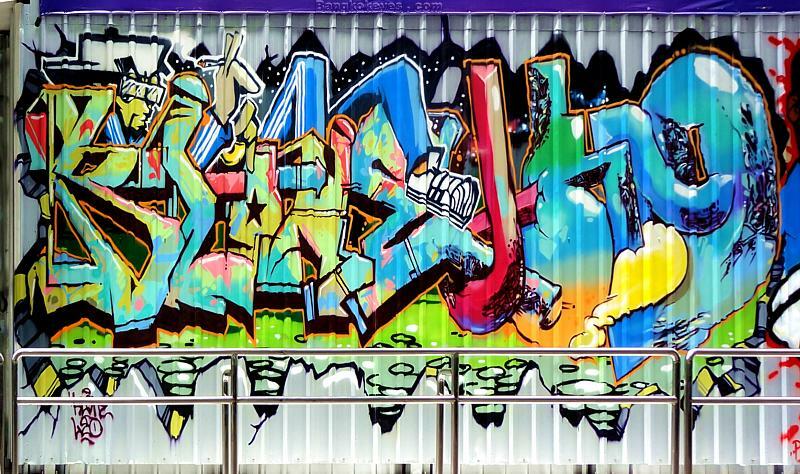 While much of the graffiti was in the ancient Hebrew language in the strictest sense, many times it was 'derived' from Hebrew in imaginative fashion by the graffiti artists. 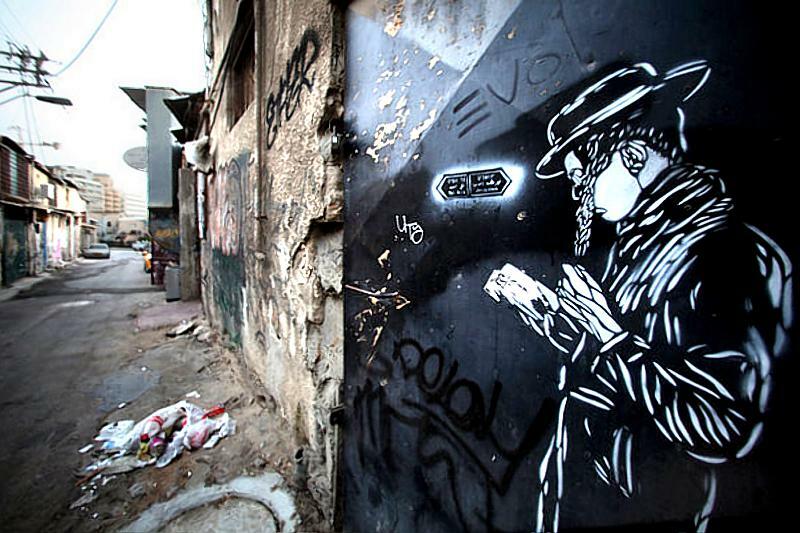 On these graffiti tours of the neighborhood, Sharret is able to put it all into context for his students, as he slowly brings the ancient national language of Israel back to life for them with real, present-day uses - and misuses, explaining as he goes along. 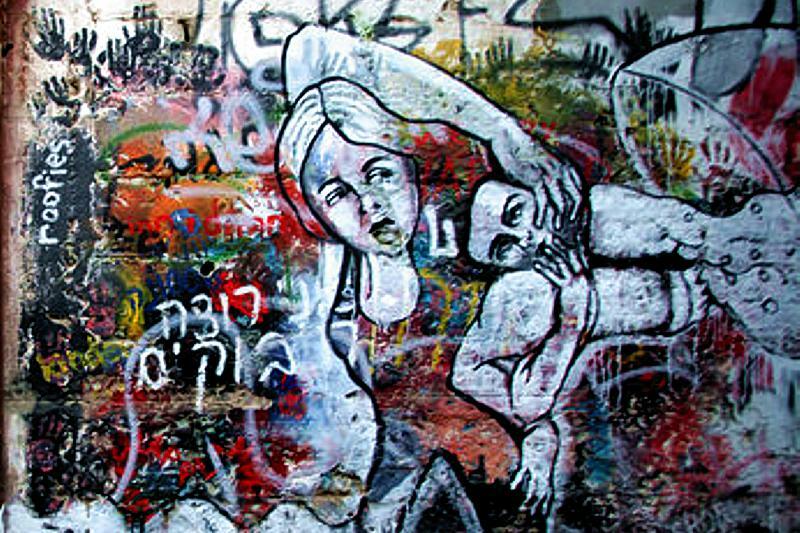 Graffiti in Israel is much more into politics, culture and everyday-life concerns, rather than just tags and artistic expressionism. Local graffiti is more a living, breathing, changing palette of current events and sentiments : a fast-track inroad into the culture itself - as seen, uncensored, from street level. And as a result, Sharret is finding that it's not only Israeli students who are signing up for the tours - his recent street walks have included a Chinese university graduate, a poet and financial consultant, an employee of Google from Rhode Island, a resident British instructor, and a political science professor from New York. 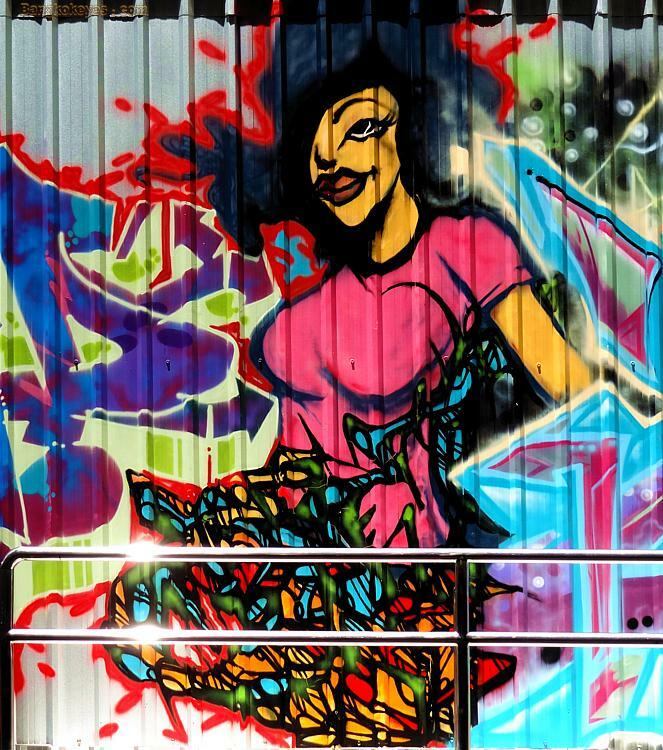 Sharret's graffiti walk-abouts are not waning in popupularity; the inverse is in fact true. 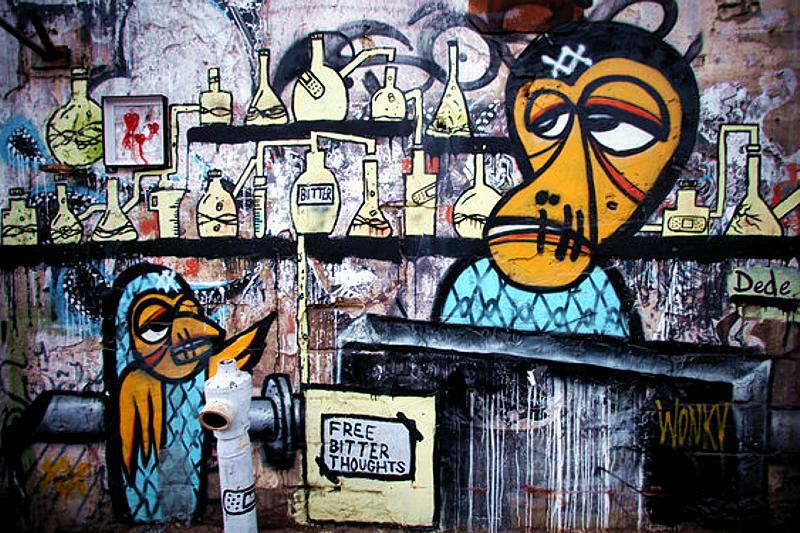 However, one wonders how much longer it will be before the tours become 'institutionalized', and, darkly, how much longer before graffiti is 'planted' along the route in an effort to propagandize these street-level learning adventures. But for the time being, they are the real thing, and continue to help make a once-archaic language 'come to life' once again. 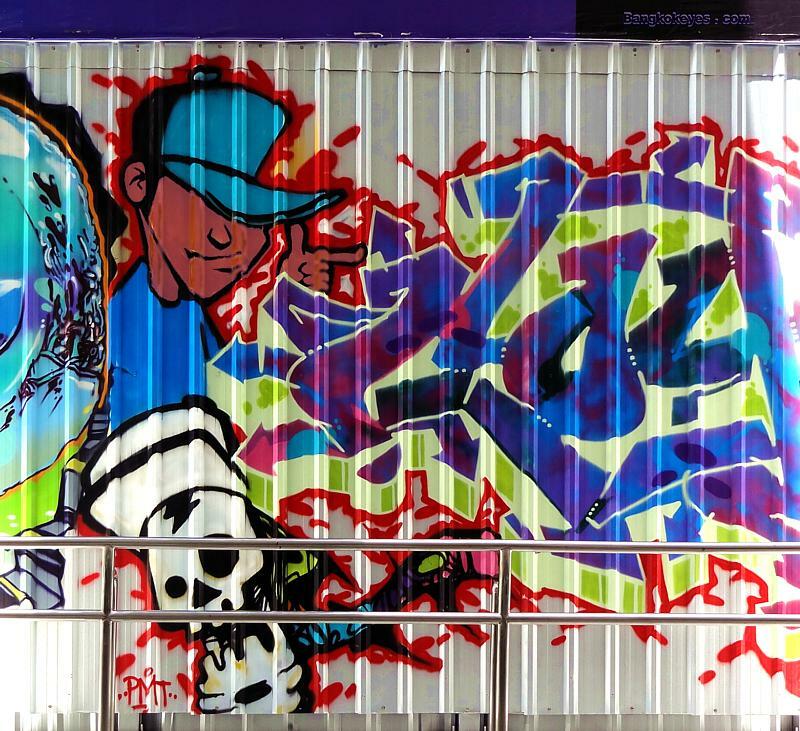 the Wall Lords Thailand 2012 competition held in June 2012. Click on any one of their below icons for results and details. 10 ft. high x 29 ft.
10 ft. high x 32 ft.
10 ft. high x 16 ft.
10 ft. high x 9 ft.
10 ft. high x 17 ft.
10 ft. high x 27 ft.
10 ft. high x 14 ft.